turn signals | Why you drive bad?! Why are you making a left?! So whenever I go to FedEx I always encounter this. I am in the left lane heading north at 40 MPH when I come to this idiotic traffic light that meters traffic into a pair of churches across the street from each other. It doesn’t matter what time of day it is, there is always someone trying to make a left into either church. WHY?! Just because you can make a left doesn’t mean you should! Plan your route better so you can make a right turn! 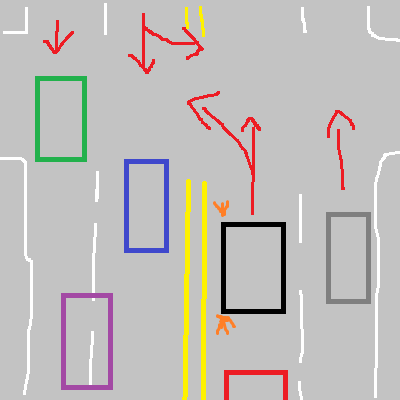 The traffic light doesn’t help either as the turns get activated and then turns into a yield-on-green where traffic just stops in the left lane while everyone and their moms are rushing by in the right lane. The engineers could have timed this traffic light similar to another one down the same street where it allows one side of traffic to make lefts and straights while the opposite side has a red and then swaps for the opposite lane after a certain amount of time. This keeps traffic flowing safely. Obviously, this would be too good of a solution and we can’t have that in the government! So cars build up in the left lane and the last person into the queue can escape by merging right when the right lane traffic clears. That is the winning move. Come up, see traffic stopped, and just jerk the wheel right, stomp on the gas, and hope there’s no cars in your way. Gotta do this swiftly and gracefully like a swan in heat. If you are unfortunate to get stuck in the left lane while everyone passes on the right, then let the flying spaghetti monster have mercy on your soul. Have you ever heard of this feature? A lot of new cars have this feature where you just tap the turn signal lever and it flashes the turn signal a few times. I don’t understand what it is trying to accomplish. Three blinks isn’t enough for a lane change. It isn’t going to make people start using their turn signal more. This feature has been on BMWs for years, and yet not a single BMW has been seen in the wild with turn signals on. It annoys people who do use their turn signals because if you hit it again to cancel it and it goes too far over then it flashes the other side. Is this just some “this is a kinda cool but serves no real purpose” feature that the engineers talked about in the break room of an automaker? And now there are aftermarket modules to add this “safety” feature to your broken-down hooptie. Yes, now you can be the only person with a Chevy Nova with somewhat functional turn signals. Congratulations on raising the resell value of your car 25 cents.